Our new payment options, explained! As of Aug. 1, 2018, Mediavine has partnered with Tipalti to bring our publishers around the globe a range of options for receiving their monthly earnings. With some of the options, Tipalti charges a transfer fee. The publisher is liable for additional fees when choosing certain payment types. Domestic ACH (Automated Clearinghouse) transfers, also known as “direct deposit” or “electronic funds transfer (EFT),” are a convenient and reliable payment method. You’ll need to enter your bank account and ABA routing transit number into your payment profile. These payments can take a few days to clear. Learn more about Domestic ACH. Great if: You don’t need your funds immediately, as they can take a few days to clear. Wire transfers, also called “credit transfers,” are an interbank payment method. They are reliable and quick because they provide a direct connection from one bank account to another. Learn more about wire transfers. Great if: You typically receive large-value payments, would like funds received quickly and are willing to incur an additional cost. International Director Deposit sometimes called “global ACH”, “eCheck” or “local bank transfer.” Because there is no formal standard for ACH across multiple countries, this method leverages the existing ACH capabilities of a country’s banks to efficiently execute cross-border payments. These payments can take a few days to clear. Learn more about International ACH. Great if: You make at least $200/month and don’t need your funds immediately, as they can take a few days to clear. Wire transfers, also called “credit transfers,” are an interbank payment method. They are reliable and quick because they provide a direct connection from one bank account to another. Furthermore, international wire transfers can easily handle cross-border transactions. Learn more about wire transfers. Great if: You typically receive large-value payments, would like funds received quickly or are looking to receive funds in USD internationally and are willing to incur an additional cost. Connect your current PayPal account through Tipalti to continue receiving your payments through PayPal. Funds are drawn from Mediavine’s PayPal account and are transferred to your PayPal account immediately. Transferring to a bank outside of the U.S. can incur additional fees. 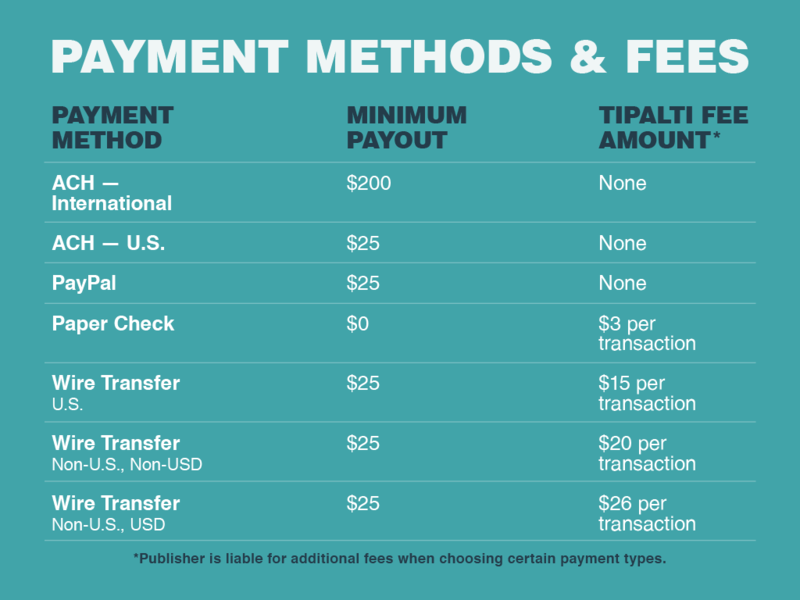 Learn more about PayPal & Tipalti, and check out the Mediavine PayPal FAQ. Great if: You are already comfortable with PayPal and your bank is in a country that doesn’t incur extra transfer fees. A physical document that can be mailed to you. You can then cash the check or deposit it directly into your own bank account. Learn more about paper checks. Great if: You do not wish to provide bank routing information electronically or other means of electronic payment, or if you just prefer banking with checks.